TESS will monitor more than 200,000 stars for temporary drops in brightness caused by planetary transits. This first-ever spaceborne all-sky transit survey will identify planets of all sizes. Data release products include: Raw full frame images, calibrated full frame images, target pixels, light curves, flat fields, pixel response function, and lists of TESS Objects of Interest (TOIs). The TESS Followup Program (TFOP) aims to complete the TESS mission Level 1 Requirement of delivering 50 transiting small planets with measured masses to the community. Looking up at a dark night sky we can see up to thousands of stars. Every star is a sun and if our sun has planets it makes sense that the other stars have planets also, and they do. We now think that every star has a planetary system, meaning our Milky Way Galaxy is teeming with exoplanets. Astronomers are turning their attention to the nearest stars, those that are bright enough with enough photons so that we may further study the planets. The nearest stars are spread all around the sky, motivating an all-sky survey. TESS is an MIT-led NASA mission, an all-sky survey for transiting exoplanets. Transiting planets are those that go in front of the star as seen from the telescope and, to date, is the most successful discovery technique for finding small exoplanets. TESS was launched on April 18, 2018 aboard a SpaceX Falcon 9 rocket out of Cape Canaveral. 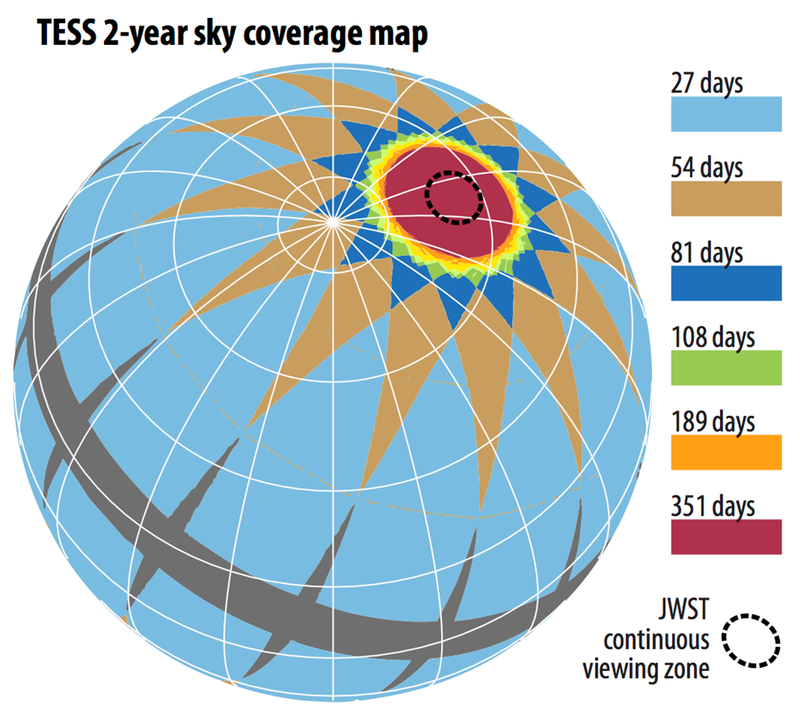 TESS will tile the sky with 26 segments, observing the southern hemisphere in the first year of mission operation and the northern hemisphere in the second year. TESS has a unique, 13.7 day, highly elliptical cislunar orbit about Earth. With a 27.4 day observing period per segment, the satellite is most sensitive to exoplanets with a periods of less than 13 days (so that at least two transits are used for discovery). The circular regions where segment overlap at the ecliptic poles have observing period of just over 100 days, enabling longer period planets to be discovered. These regions are known as the continuous viewing zones (CVZs). TESS has four identical cameras. Each camera has four 2k x 2k CCDs with a pixel scale of 21 arcseconds per pixel. The detectors are sensitive from 600-1000nm (blue to the near-IR). TESS aims for 50 ppm photometric precision on stars with TESS magnitude 9-15, although brighter stars can also be monitored. Every sector, the TESS spacecraft will downlink about 200,000 two-minute cadence postage stamps, as well as full frame images binned on board at a 30-minute cadence. The team has prepared the TESS Input Catalog (TIC) of over 1 billion objects, with a special subset Candidate Target List (CTL) of 200,000 objects for the two-minute cadence observations. TESS anticipates the discovery of thousands of exoplanets of all sizes around a variety of star types. It has committed to delivering 50 planets of size less than 4 Earth radii with measured masses to the community. 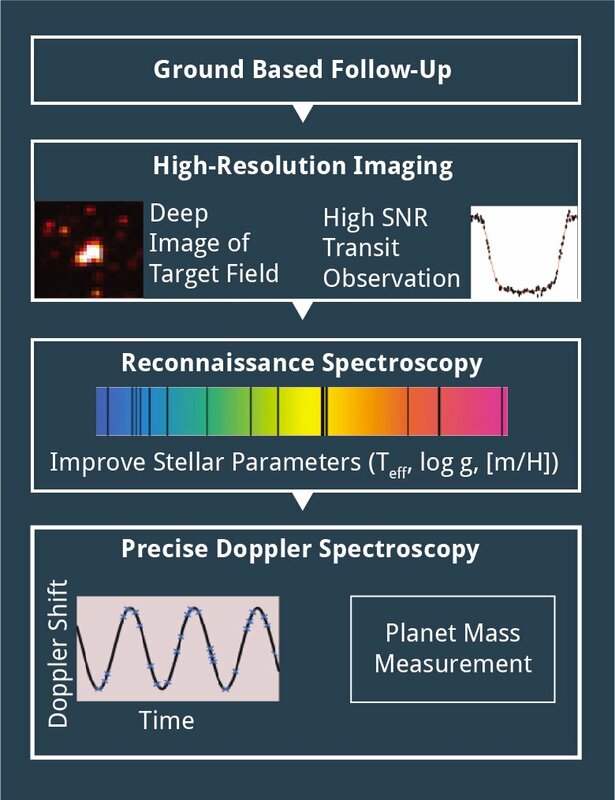 An international effort under the TESS Follow-up Operations Program (TFOP) is committed to observations to distill the TESS planet candidates down to the list of 50 with measured masses, using the best ground-based telescopes in the world.